I think I'm still trying to hold onto summer with this recipe. Tomato season is over, but I still don't want to let it go. The weather this week is supposed to get up to 80 degrees, which doesn't help my body transition into fall. 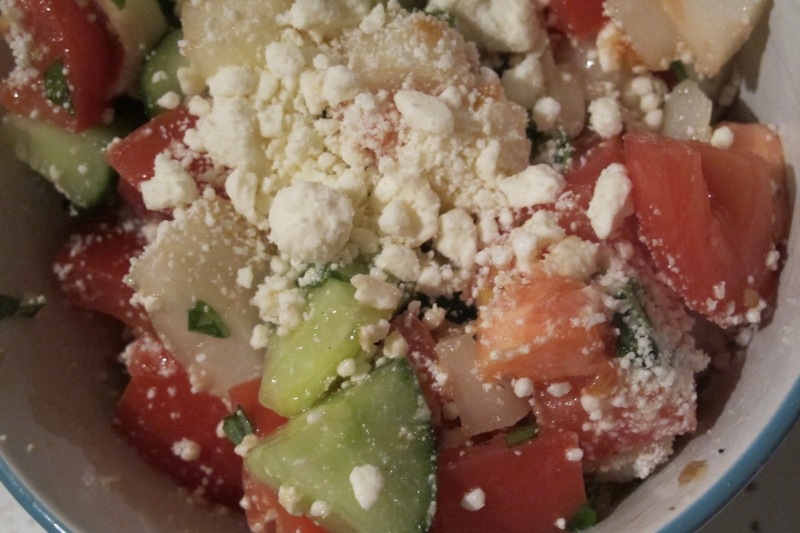 In the summer, my father regularly makes big bowls of salad with mounds of tomato, cucumber, basil and extra virgin olive oil. This salad is very similar except for the addition of feta cheese. I found the tomato salad recipe on allrecipes.com. I used a small onion instead of green onions and used dried wine vinegar instead of balsamic vinegar. 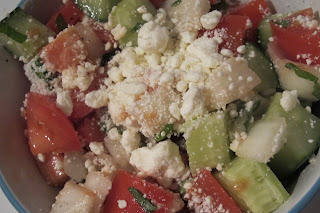 I also used more feta. 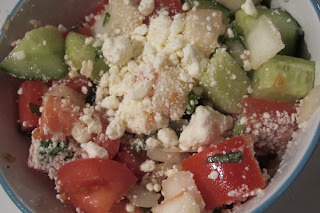 The ingredients are 6 roma tomatoes, 1 small cucumber, 1 small onion, 1/4 cup fresh basil, 3 tablespoons extra virgin olive oil, 2 tablespoons red wine vinegar, 1/2 cup crumbled feta cheese, salt, and pepper. I added the chopped tomatoes, cucumber, and onion into a bowl. I added the thinly cut basil, extra virgin olive oil, red wine vinegar, salt, and pepper. I stirred the salad together. On top of each serving, I added a few generous scoops of feta cheese. I didn't add it in with the salad immediately because I ate the salad over a few days and didn't want the cheese to get soggy. It was a light and refreshing salad. It was a little tangy and salty. It was a colorful, bright, and healthy salad. It is a simple salad. The taste improves after a day or two. The flavors meld and deepen. It was very appetizing and delicious. It made a great side to my pack lunches.